Winter in the northeast is often the season when growing things take a rest. Creatures like bears, bats, chipmunks, groundhogs, snakes, and even bees go into hibernation. Trees, shrubs and perennials enter a dormancy state in which metabolism, energy consumption, and growth slows down. But in the TREE neighborhood at EcoVillage Ithaca, the work of “growing” a sustainable community continues at a steady pace, even in winter. TREE is the third and newest neighborhood at EcoVillage Ithaca (EVI), joining the established FROG and SONG neighborhoods. Utilizing the newly established governance system called “Dynamic Governance” (DG, also known as “Sociocracy,”) residents have been gathering during the winter in work circles that meet on a weekly basis to continue the projects begun in the past year. These include a Plants, Animals, and Land Circle (PALS), a Fencing Sub-Circle, a Composting Sub-Circle, and a Landscape and Gardening Sub-Circle. Projects are being researched, planned, and designed. One of the Spring projects that I and many TREE residents are excited about is a neighborhood community garden. Both the FROG and SONG neighborhoods have established community gardens but this will be a new addition to TREE. Initial planning on this project was begun long before the first homes were built. The Landscaping and Gardening Sub-circle has been tasked with planning and design of the components that will make up the TREE community garden. This group has been holding weekly planning meetings since the fall. A one hour outdoor work party usually follows when weather permits. Members of the Landscape and Gardening Sub-Circle bring a good deal of gardening and plant growing experience to the process. In recent years members have jointly attended talks, courses, and workshops in permaculture design. 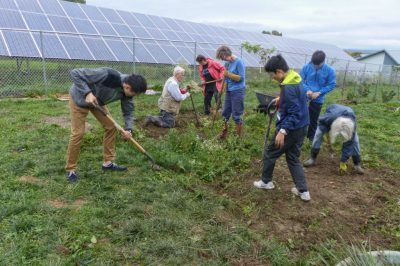 Three members, Lisa Ripperton, Terry Hadley, and Pat Evans, attended a Community training in Ecological Design Course sponsored by The Finger Lakes Permaculture Institute. Members also attended a Permaculture Convergence Conference this past fall. And some folks have also attended local workshops in plant propagation and mushroom log inoculation. These joint endeavors help to nourish the growth of community! The permaculture design concepts they learned are being used in the design of the TREE community garden, which will include several components. 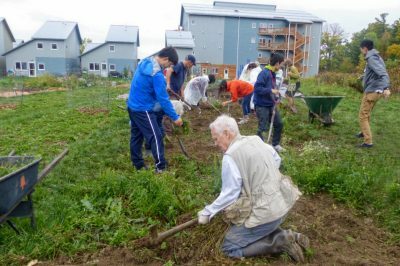 At the northern part an edible forest garden is being developed and at the western border a community shared meal or kitchen garden is planned. The center area has been carefully measured and divided into separate plots for individual stakeholders to plant their own food gardens. Trees, shrubs, and plants are being chosen and ordered at the January meetings for planting in the Spring. Permaculture design concepts are being considered in choosing the trees, shrubs, and plants to be included in the edible forest garden section. Plants of varying heights for the tree, shrub, herb, and ground cover layers will be included. Numerous native species will be planted as well as nitrogen fixers. Plants will be positioned per their light and moisture requirements, and how well they coexist together. The TREE community continues to grow this winter in many ways. Ro recently shared her experience as a retired children’s librarian by offering a story-time puppet show and a series of collage workshops. The greater TREE community will be encouraged to help in planting, caring for, and, soon in harvesting and sharing of the bounty from the newly sprouted TREE Community Garden.